A couple of weeks ago, I presented at KidLitCon with three other librarians. Two of us couldn’t be there in person and participated on our panel via Google Hangout. Our panel was about critical reviewing (“critical” meaning “thoughtful and analytical,” not “only negative”) and one of the things we talked briefly about was whether to write your own summaries of a book or to use the publisher’s copy. One of the reasons I like to write my own is that I often feel that the publisher’s summary slants the book in a way that I feel is not really very accurate. Sometimes it makes the story appear to be about something it’s not really about at all. Sometimes it skews the characters. Sometimes I feel quite certain the person writing the summary didn’t actually read the book at all. How to Be an American Housewife is one of those books where I thought the summary was quite a bit off base. It says (thank you, Goodreads): A lively and surprising novel about a Japanese woman with a closely guarded secret, the American daughter who strives to live up to her mother’s standards, and the rejuvenating power of forgiveness. 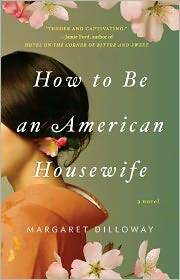 I reread that after finishing How to Be an American Housewife and was surprised at how off-base that summary felt to me. The closely guarded secret? I didn’t feel like that was the crux of the story. It came up a few times, but one of the defining parts of the book – I do not think so. Also, when the secret is finally resolved, it happens so fast that, even without remembering that it was supposed to a main plot point, I noted how brief and swift it felt. As for the American daughter trying to live up to her mother’s standards, I didn’t see that at all. To me, it felt more like it was a disconnect between the two of them. Actually, reading that summary makes me wish the book had more closely followed what the summary suggests the book is about. It sounds quite fantastic. Unfortunately, while it was a quick and entertaining-enough read, I didn’t particularly love it or have any desire to bore Bart with long detailed descriptions of it. It was a squarely three-star book for me. Fine, but not fantastic. The Great Alone (a fantastic novel about making a new life in a foreign land – Alaska, in this case). I am paid for my participation in the BlogHer Book Club, but I choose which books to read and my reviews are strictly my own opinions. If I think a book is terrible, I’ll say so. If I rave about a book, it’s because it’s one I’d give to my mom or a good friend. Exactly. I'm the kind of person who MUST finish what she's started (books included.) I cannot tell you how many reads I've been angry at at half way through because the description on the flap was deceptive. I find the book summaries on book covers to be quite baffling at times. Who writes them? In the case of the only (non fiction) books I've worked on, I was the one who wrote them (or someone on the author's side). But all too often it DOES seem like the book summary has nothing to do with the book. I am reading a book right now where the back cover MISSPELLS a character's name. TWICE. On the back cover! It's egregious. "…didn't actually read the book at all." you hit that dead on. Thanks for reading! Sorry you didn't enjoy it as much as the flap promised. Just pass it on to someone you don't like;) Oh, the editor writes the copy for the flap, and she definitely read it– lived with it for 2 years. Seriously, WHO writes those things? Sad this one wasn't better. I like the cover (insert comment about judging books by covers).